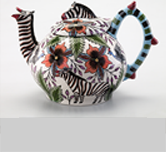 The Nelson Mandela Metropolitan Art Museum has one of the country’s noteworthy collections of craft. This exhibition will celebrate the museum’s commitment to elevating craft objects into the realm of art. A selection of objects from the Museum’s collection of ceramics, Chinese and other textiles and Southern Nguni Beadwork will be on display.